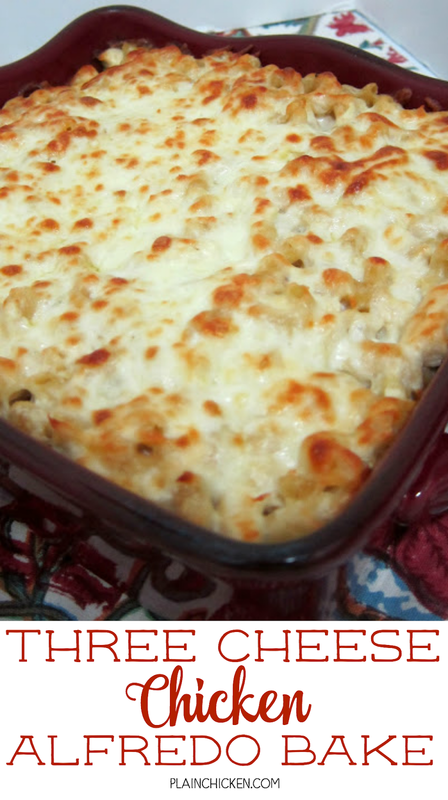 Three Cheese Chicken Alfredo Bake - great make-ahead pasta dish. 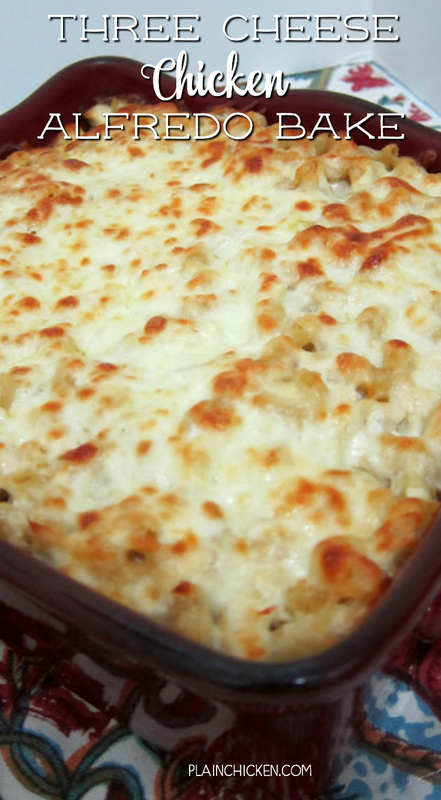 Elbow macaroni, alfredo sauce, sour cream, ricotta, garlic, chicken, eggs, parmesan and mozzarella cheese. SO good!! We make this at least once a month! Can freeze half for later. This is THE BEST pasta casserole we've ever eaten!!! Everyday Southern Living tweets a dinner idea. A few days ago they tweeted about a Three Cheese Pasta Bake for dinner. I checked out the recipe and thought it sounded fantastic! I decided to give it a try - with a few changes. The original recipe used ziti. I didn't have any ziti; I only had elbow macaroni. I went with the elbow macaroni and it was fine. I also added chicken to make this more of a meal than a side dish. This was SO good! It was even good reheated the next day for lunch. If you don't like ricotta, try substituting cottage cheese. I halved the recipe below and it was enough for at least 4 or 5 people. Stir together all ingredients except mozzarella cheese. Spread mixture into a lightly greased 13- x 9-inch baking dish. Sprinkle evenly with mozzarella cheese. Looks so cheesy and wonderful. Pasta dishes...they just hit the spot. This looks delicious! I know my daughter would love this. Thanks for sharing! So, is this the halved recipe or the full recipe? I believe it's the full recipe. That Girl - I posted the full recipe. It would be enough for 8-10 people. Can I can make this in one of those aluminum pans, since i actually have to double to make for 15 ppl. Have to make this! All my favorite ingredients are in it! :) YUM. That's a whole lot of delicious cheesiness right there. I'd love to dive right into the middle of that with a spoon. My only problem is the chicken (which I don't eat) So I would replace that with some beef or pork and then it sounds lovely. Holy comfort food! Steph that looks so good. It will definately have to make it into my rotation in the next couple weeks. As soon as a cold or rainy day comes my way, it's on! My mom gets it for me for Christmas every year and I treasure it. Made this a few nights after I made your chuckwagon stew....incedible hit here! I didn't know that was the full recipe and I made it all--we had a whole lotta this for leftovers. My son, who is the pickiest eater alive, really loved the noodles--I used Rotini instead. Thanks! I made this this weekend and yum-ME! Will be making again very soon. It's very rich but SO good! Thanks for sharing all this great stuff with us. Do you think it would be ok to leave out the eggs? Leaving out the eggs would change the consistency. Eggs are used a lot for binding. Might make it creamier. Not a bad idea. Kelly - I think it would be OK to leave out the eggs. Made this last night! Used penne noodles, cottage cheese vs the ricotta, and did not add the parsley. It was great! Next time will only use HALF of everything though because it was ALOT of food! Ok, making this today. My cheese hating hubby is out of town...so my girls and I are cooking every cheese meal we can! It's true...the mice will play! I just pulled this out of the oven and I am super excited to try it! It made a crap load of food! Hi! This looks wonderful! I do have 2 questions...1) Do you think you can add broccoil? and if so would you think frozen or fresh and 2) do you think you could make this and just freeze half? Meg - yes, I think you could add broccoli. Fresh or Frozen would work. I've never frozen it, but I think it would be fine. I always just make half and it is still a ton of food. what makes this even better is the lovely Cinnabar casserole dish from Willow House!!! Can I make 1 day ahead of time and refrigerate until I bake it? Gotta try this looks fantastic!!!! I made this with cottage cheese instead of the ricotta, halved the recipe, used chicken breast that I first seasoned and grilled, THEN cubed....and also added about 8-10 slices of bacon, crumbled up and added in....can you guess how amazing it was? ;-D Thanks! Jayson - Bacon? YUM! I'm going to try that next time!! Can anyone recommend a good jar of Alfredo sauce? I use to make my own, but my daughter said she uses Bertolli so I tried it. Now that's all I use. I use to make my own, but my daughter said she uses Bertolli, now that's all I use. It is really good. I just made this for dinner tonight and it is delicious and very east to make! I had some Hawaiian bread on the side to make the meal complete! Oh heavens. Seriously, I would stand hunched over the stove and eat this directly out of the casserole dish. My family LOVED it! Made this tonight .. I didn't love the texture. I would've preferred more creamy, but mine chunked up. Leaving out the eggs might have helped? I think that's true, since eggs are often used as a binder. I like creamy too. I'd love to make this!! Can you recommend a good jar of Alfredo sauce?? I have family coming over tonight, and I think this with the broccoli added as someone else suggested might be perfect. @Samantha & QueenB - I use Bertolli alfredo sauce (next to spaghetti sauces in the store). They have a variety of flavors. I usually add some garlic to it though. Made this for dinner tonight. It is a keeper! My boys loved it--even my picky 3-year old didn't fuss! Can this be made without ricotta? I want to make it now. If you don't want ricotta or cottage cheese, what else can you substitute? Michelle - you could use cottage cheese instead of the ricotta. I usually make my own alfredo sauce (so much better than from a jar, in my opinion--and very easy to make). Do you think that would work? I've never baked it with anything, and I'm worried about the sauce separating and being gross with leftovers (the primary ingredients are milk, cream cheese, butter, and parmesan cheese). I made the recipe the way you wrote it and it was good, but I have a taste preference for my homemade sauce. Homemade sauce will work fine. but on second thought, I'm not sure about the cream cheese. Can you recommend an alfredo sauce to buy from the store? Thanks! I made it last night and I love it. My husband liked it but thought it was a little bland. What seasoning or a little something would be good to add to keep the same recipe but add alittle more umph? I really do like it. Jennifer - you could add Italia seasoning and some garlic. Or you could go in a completely different direction and add Cajun seasoning for a kick. This is so amazingly good. I want to make it again SO badly..we even forgot the parsley and it was still great! Mmmm. Even great heated up the next day. crzygrl07 - glad to hear that you liked it! Do you think I could add frozen spinach to this recipe for a frozen meal for a family? Trying to think of a veggie to go along with this? Also, did you use whole wheat pasta noodles? Spring13 - you could add spinach or broccoli to this and it would be great. We usually have a small side salad or asparagus with this dish. I didn't use whole wheat noodles, but I think it would be fine. just made this dish and it was great. Heidig3406 - I don't see why jarred Alfredo wouldn't work. Let us know how it turned out! Oh, also i used Alfredo saucer from a jar & it was good! Instead of usinf ricotta or cottage cheese, I plan on using mascarpone, so much nicer than ricotta or cottage cheese (plus, that's how I make my homemade mac n' cheese). Or using greek yogurt is really nice too! I also agree with the poster who said to sautee the garlic in butter first, I would add basil and crushed red pepper flakes... I'm trying it tonight! I use the bertolli alfredo sauce in the refrigerator section next to the butter and cream cheese") yummy! I will be trying this recipe ASAP.. Adding this recipe to my monthly meal rotation. Does Southern Living have a Pinterest account i can follow? Looks so good!! Making this right now and SO excited to finally try it! TY! I made this recipe a couple of months ago and my entire family loved it! And that is saying a lot because I have a couple of picky eaters. I plan to make it tonight and wondering how you felt on freezing half of it? My children have a busy after school schedule and I have been trying to find good freezer friendly meals to get a head start on those busy nights. I have almost completely cut out take out food from our diet! I was just not sure if this amazing meal would be freezer friendly. Thank you for sharing your great recipes! mom2KandK - I don't think there would be an issue to freezing this dish. I totally understand busy weeknights! Great idea. My husband and I just prepared this dish for dinner and it was delicious! Next time, I will season my pasta noodles. I thought all of the cheeses and sauce would be enough, but it could have tolerated a little more. It was rich and delicious. Will definitely be making this again. I seasoned the chicken before adding it to the rest of the recipe and let me tell ya we ate it up. thank you so much for great recipes. Do you think crushed ritz crackers would be good on it or no? I plan to make this. Will make and divide into two separate casserole pans. One goes to our Pastor's family. Wondering how many days ahead this could be made before baking it? Made this for memorial weekend. Great ! Big hit ! Will make again. I'm finding this recipe nine years after you posted it! I had wanted to add rotisserie chicken, but when I went to put it in, I felt it was a few days beyond what we should use. I thought of heading out to pick up another chicken, but then I thought ... hmmm, what do I have on hand that I can use? I had some frozen italian meatballs, so I heated those and added them into the mix instead of the chicken. Oh - so - good! Thanks for this recipe!